We were told he was born in August, according to the zodiac calendar a Leo. My mother who casually followed astrology named him Rex, which by definition we considered him to be, the King Of Kings. We use to dress him up in a shirt that covered his private parts in respect to revealing them to the neighborhood kids. 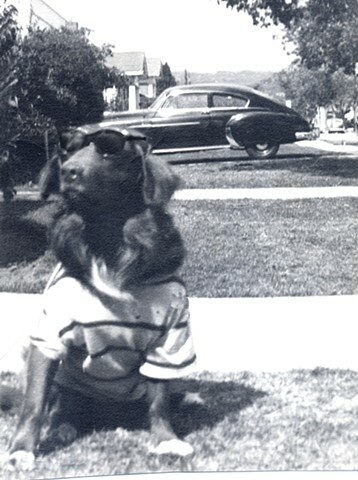 Living in Hollywood in the early 1950’s it was expectable apparel to wear sunglasses, so we had him look cool for neighbors passing by. As a mutt, he was part Cocker Spaniel and Irish setter. Our next-door neighbor had purchased a new modern 1951 fast-back Chevrolet that we adored.Times were good back then so like “Monkey See Monkey Do” we followed suit and bought the same car shortly afterwards. Rex was always the first to enter our car when we went somewhere, but sometimes confused, he waited at the wrong car. Rexie and I are also at:rvmann.com/artwork/2895078_My_Friend_An?